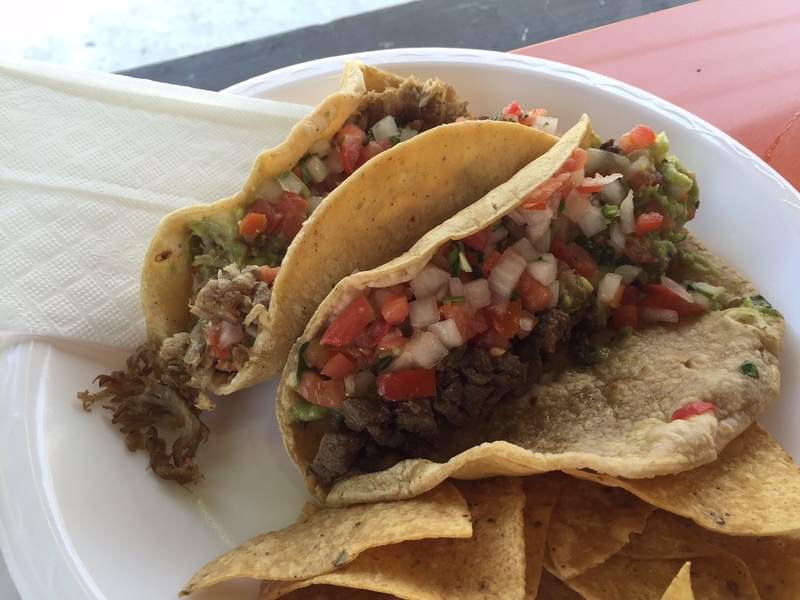 There are very few taco stands in gas stations around Los Angeles. So, I have to get more creative on what a “Gas Station Taco” is which leads me to today’s review of Benito’s Taco Shop on Fairfax and Beverly Boulevard. Benitos sits next door to a Shell gas station near The Grove and CBS Studios. It’s a busy area in Mid-West City LA. I have passed it for years wanting to give a try. 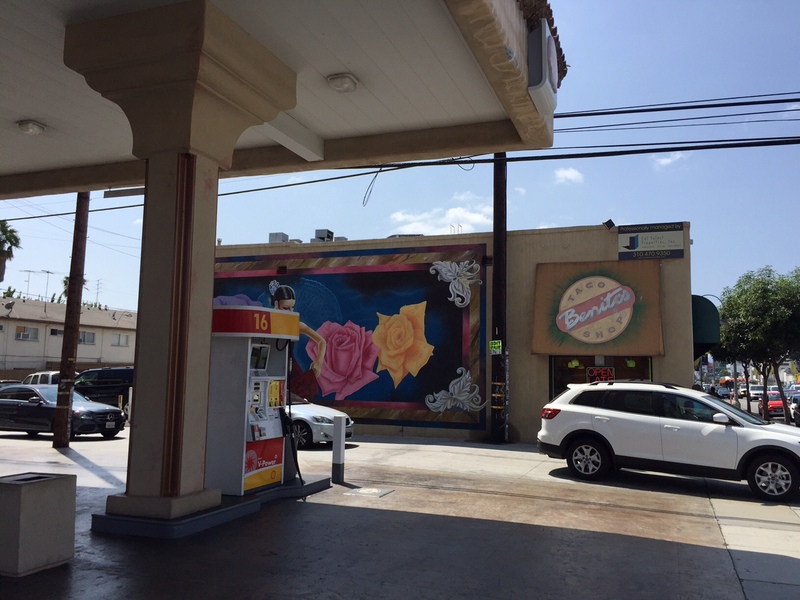 The taco shop has a beautiful mural painted on the side of the building that catches your eye, even if the taco shop itself is insignificant. 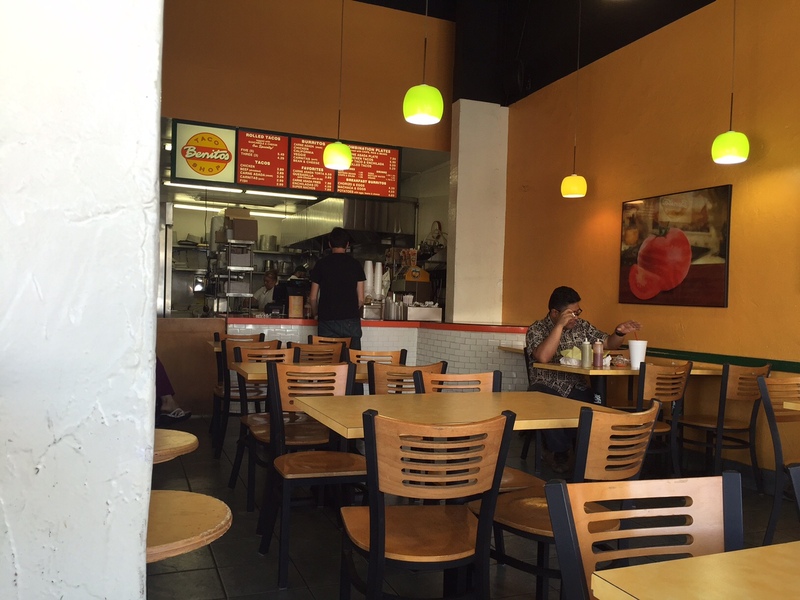 The place is more fast food in its aesthetic than a more traditional Tacqueria. The tables are are all formica and a lighted, rather sparse menu is above the cash register. There’s a bucket of red and green salsa squirt bottles on the counter. I ordered the Rolled Tacos since it was listed as their “Speciality.” I also went with carne asada and carnitas tacos to try their non-deep fried versions. The salsas were very watery and I wasn’t expecting much from Benitos due to their fast food atmosphere and focus on taquitos, aka rolled tacos. My order arrived on styrofoam plates and a plastic tray. The rolled tacos were covered with guacamole and shredded cheddar cheese. They weren’t bad, similar yet slightly better than what you get at a Baja Fresh chain. The salsa verde has a little more flavor than the salsa roja that didn’t add much to the taquitos or other tacos I ordered. The guacamole wasn’t bad and the side of chips that came with it made for a decent inexpensive lunch. The carne asada and carnitas tacos were pretty big in size which made sense since they were $2.29 and $2.99 respectively. Both came loaded with meat in a corn tortillas that was pulled out of a bag from a grocery store. The loads of meat also came with pico de gallo and guacamole, I should’ve asked what came with it. The wetness of the diced tomatoes and guacamole made the packaged tortilla soggy and I’m not a fan of anything other than diced onions and chopped cilantro in a taco. The carnitas meat was surprisingly good with a slightly burnt crust to some shredded pieces. The carne asada wasn’t as good, but wasn’t fatty or too chewy. Sadly the tortilla and toppings took away from some decent pork and beef. Overall, Benitos Taco Shop could’ve been a lot worse. While it suffers in its fast food trappings, the rolled tacos weren’t too bad and the carnitas meat was flavorful and worth ordering again. Of course, next time I’ll ask for something other than pico de gallo and guacamole. I didn’t check to see if they had chopped onions and cilantro. The carnitas makes a decent burrito which is also on the menu for a cheap decent lunch.